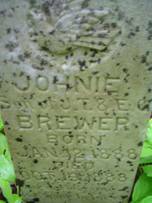 The Brewer Cemetery lies on private property in South/Central Wayne County, Tennessee. The property line passes through the cemetery dividing the personal property of Bill Cauley & Thomas Evans. If one visits this cemetery, for the sake of courtesy, please ask, or call Mr. Bill Cauley at 1-931-724-5771. From the Alabama/Tennessee State Line, travel north on the Natchez Trace Parkway for approximately 4.6 miles. Turn left onto Holly Rd. and go about one tenth mile. Turn right onto Big Cypress Rd. and go approximately one tenth mile. The drive to the residence is gated farther up the hill, so please call the number listed above to visit the cemetery. Enumerated by David Montgomery on May 11, 2010. 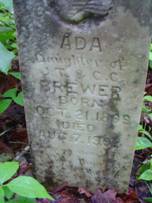 Brewer, Ada; b. 21 Oct 1899, d. 07 Aug 1903, daughter of J.T. & E.C. Brewer, Johnie; b. 12 Jan 1888, d. 19 Oct 1888, son of J.T. & E.C. Brewer, Ellen; b. 26 Nov 1855, d. 07 May 1893, wife of J.T. 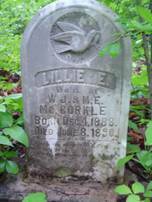 McCorkle, Lillie E.; b. 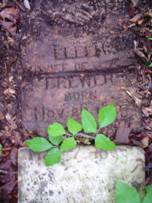 04 Dec 1888, d. 08 Jun 1890, daughter of W.J. & M.E.